That’s how I began a conversation with my counselor a few months back. It’s several months later now, and my business no longer exists. You’re probably wondering: what happened? What led me to this decision? It had nothing to do with money or a failure so bad I couldn’t come back from it. It was a personal choice I’ll tell you about later in this article. First, I think it’s more important you learn the same lessons I did from growing successful 6-figure business in just 1 year. Most people only want to pay attention to what they want to believe about entrepreneurship. This won’t help you if you’re trying to build a business that stands the test of time. NOTE: Most of these lessons are in chronological order. You’ll see how the story of my business unfolded. Entrepreneurs attempt brave pursuits for a living. Confidence—in themselves and what they’re doing—keeps them moving forward. Losing confidence is a poison in your business. Without confidence, you stress more, tire easily, and lose hope. You need to make investments in anything that’ll keep your confidence strong. Right before my business experienced a huge growth spurt, I decided I needed to change my working environment. At the time, we were living in a two-bedroom apartment in South Nashville. The place wasn’t bad at all. But I lost a piece of my sanity every time the elderly woman living below us banged on the ceiling to quiet us down. She liked her space to be quieter than a convent. I chose to move us to a much nicer house in an expensive community. Even though it was out of our budget at the time, I firmly believe this investment contributed to my confidence. Waking up to do work in a place I love felt great. And this confidence allowed me to 3x my income in just one month. So make investments in your confidence. You’ll need it to keep bravery alive. 2. Invest more in people than in things. 3. Hire and train an executive assistant fast. As soon as I started making real money, I should’ve brought in an executive assistant to help me with all the tasks that ate up my time. Eventually, I learned and hired an excellent executive assistant. But I did NOTHING to train this assistant. He learned everything on his own while I did nothing to empower him to do the job. So my advice: invest in an executive assistant. Even if you don’t think you need one. Assistants help you grow faster by saving your brain power for more important matters. Hire someone great and train them fast. 4. Pay attention to two things: the truth and the present. From there, things got hard. Believe it or not, but people are mean on the Internet. Who knew? None of these negative comments about me were based on the truth. And they were spoken from people who didn’t take the time to get to know me. But they still hurt. Some people really know how to comfort! But these words woke me up to the truth of the matter. None of these people were my friends. They didn’t know me. So why pay attention to their false words? Pause the thoughts in your brain and silence all the stupid stuff. Ask yourself: what is true in this situation? Pay attention to that truth. Most of what trips us is a lie. If you add your opinion or self-defeating talk on top of an already troubling situation, you’ll amplify it. Learn to focus on the truth, and you’ll get over things faster. And when things just get too heavy to bear, then focus on the present—what you have to do now. Much of the opinion, self-defeating talk, and lies we add onto situations are learned responses from our past. And most of frustration is born from overemphasizing our future. Learn to silence your mind and focus on the present moment. This will help you return to the work faster. 5. Resist the urge to change everything when you panic. 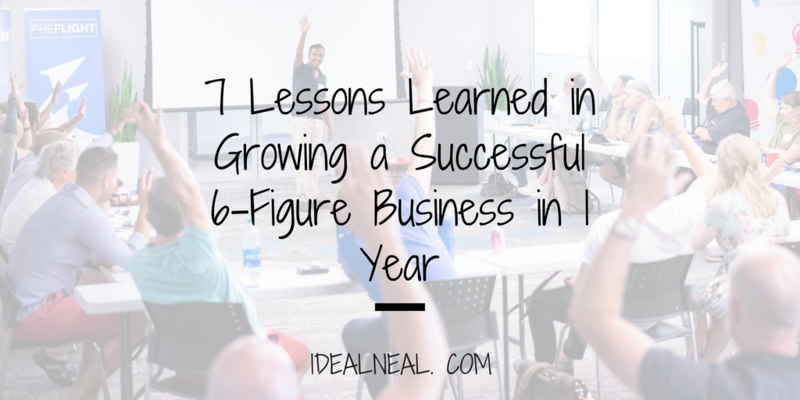 After my incredible growth spurt, business started slowing down. This wasn’t abnormal, but my brain treated it like it was. So I panicked. The worst thing you could do when you panic is change everything about your business. And that’s exactly what I did. When my ads weren’t working and leads started to dry up, I thought it was a problem with my offer. I changed my offer, and things just got worse. If you’re looking for stability, you’re not going to find it by ripping the ground from underneath you. You find it when you plant your feet firm and ride the wave. Changing foundational things in a period of instability further reinforces the instability. I learned this lesson the hard way. 6. Don’t become your business. Things eventually got better. I made my new offer work. Money was flowing like honey again. But by then, I was tired. So I started asking around for a counselor. That’s when I found Steve—the coolest guy EVER. I asked him why I wasn’t happy, why I was overly emotional about things regarding my business, and why I was more tired than ever. He then started asking me questions about my childhood, my parents, and other things that confused me. I had become my business. My business had consumed every dimension of my life. The only thing I had going for me was money. Everything else fell under the weight of my ambition. Here’s what happened: I spent so much time trying to grow a successful business that I began to infuse my identity with the business. So when people spoke ill of my business or when I ran into a issue with money, they all affected me personally. On top of this, I was using my business to validate that I mattered in the world. I was important because I was a successful entrepreneur. All of us want to be told “we matter”—and some of us build statues and empires just to prove the point. But when our significance becomes reliant on an identity we forge, something is wrong. Every contribution we make from this position is just a plea to be loved. If your business is trying to solve a deep hurt or lack of something in your soul, then I urge you to strongly consider the role it plays in your life. Business is already hard as it is. Don’t make it harder by tying your self-worth into the equation. 7. Connect with your ideals often. After months of counseling, I did an exercise at the start of the new year. I took my journal and pencil to Starbucks and journaled about what I really wanted in life. I asked myself what I really wanted … and the result astonished me. I never wanted a successful business. I never cared about making as much money as I was making. Being known for these things would’ve appealed to my vanity, but nothing more. What I wanted was everything I wasn’t paying attention to … an amazing relationship with my wife, friends who love me, and a contribution where I wasn’t trying to prove anything to the world. In that time, I wrote down all of my ideal values, ideal lifestyle, ideal week, etc. And none of it matched my current life. Growing in self-awareness is the greatest thing you can do for your spirit. You never want to be in a situation where you wake up and discover you’ve been charging in the wrong direction for so long. To combat this, create a habit where you reconnect with your ideals often. Take your journal and pencil, go to Starbucks, and write down all the things you want in life. Keep it somewhere safe, and reconnect with it when you get lost and need reminding. When I discovered I wasn’t living my ideal life, I decided to transition away from my business. I joined as the copywriter for Michael Hyatt & Company. As a result, I’m finally experiencing greater satisfaction, fulfillment, and impact in my work. All the dimensions of my life are receiving the proper care they need to thrive. And while I did take a paycut, everything else is my life is working as it should be. I’m the little brown dot in the back. This is why I left my business. This is my restart. The rest of the content you’ll see on this website will help you become your ideal self. Why? Because we need more contribution where we aren’t trying to prove anything to the world. We need contribution that arises from a person who has nothing to prove to anyone but himself. Become your ideal self and watch your impact and contribution explode. I hope these 7 lessons helped you take the first steps to your ideal self.